Users in Virtual Contact Center (VCC) are grouped into agents and administrators. Agents handle customer interactions channeled through the contact center while administrators configure the contact center's resources and behavior. Virtual Contact Center supports regular agents and supervisors. Supervisors have additional abilities to monitor agent and queue performance. Agents: You can create agents, assign phone number and devices, and set up basic and advanced features. Agents use Agent Console to view and manage customer interactions. Administrators: An administrator can be a primary administrator with unrestricted access to all the configuration objects, or a secondary administrator with full or partial configuration rights. The primary administrator creates the user accounts and can assign secondary administrator rights. User creation: Add users individually or in bulk. To add users in bulk, download the basic or advanced template, and upload data. You can create users in bulk and save time. Agents with dedicated extensions: Contact center agents who must be dedicated to handling only the contact center calls, must be assigned with dedicated extensions. These agents are assigned with an 8x8 supported SIP phone which can handle only those calls routed via Virtual Contact Center voice channels. With a dedicated extension, the extension and Direct-in-Dial (DID) numbers are permanently redirected to Virtual Contact Center agent channels.The agents can serve multimedia channels (voice, chat, email). Agents without dedicated extensions: Add agents without dedicated extensions, and with a minimum account, to serve digital channels, such as chat and email, only. Agent voice channels: Phone numbers assigned to agents function as dedicated agent channels. Callers can reach agents directly via these channels. Service channels: All phone number assigned to Virtual Contact Center function as service channels. 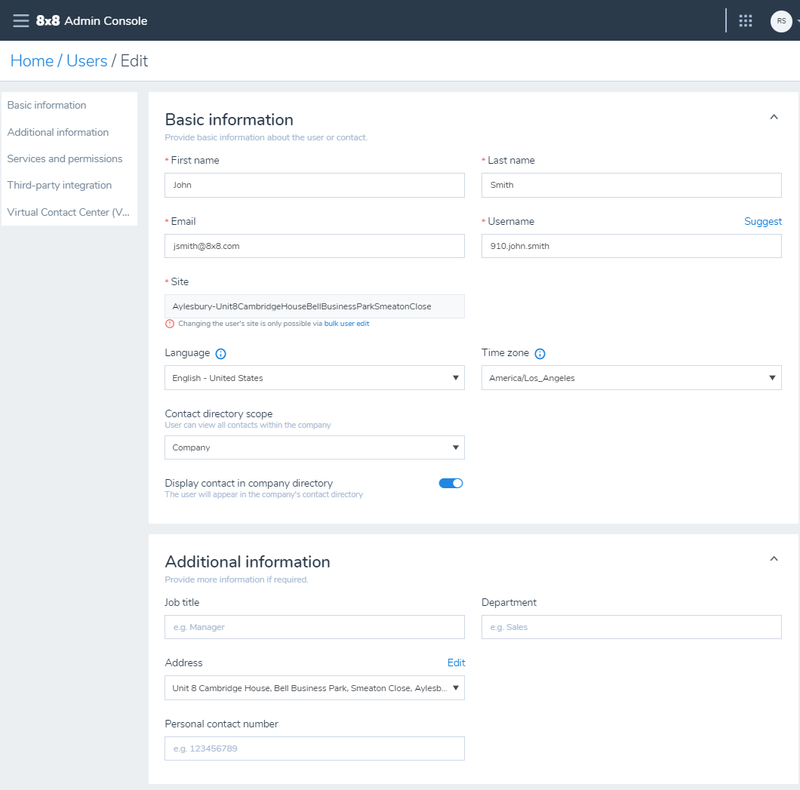 You can edit a service channel, and enable or disable it in Virtual Contact Center Configuration Manager. An IVR script is linked to the service channel by default. You can add agents in Configuration Manager without dedicated extensions, and set up a minimum user account to serve digital channels. From the main menu in Configuration Manager, go to Users > + Create User. It allows you to create individual users. Enter the Basic Information, and select a service. Username: By default, the system recommends a username created from company name, first name, and last name, and notifies you if a duplicate exists. For example, John Smith of AcmeJets Corporation sees this username by default: AcmeJets.John.Smith. If you wish to create a different username, it must be unique and never used before. Site: Site is the location of your business. By default, your phone system is assigned to a site based on the service address provided. The emergency address and language fields are derived from the site. The site's country is the default address country in the user account. You can modify the above values if needed. See how to set up sites. Language: Language controls the language of the voice prompts, email notifications, and device display. Time Zone: Time zone is used for downloading call recordings, viewing call queues, and scheduling and running reports when logged in as the current administrator. Display contact in company directory: You can hide users, rings groups, call queues, internal fax numbers, etc., from the public in the company's contact directory. If the display option is disabled, the name and number is no longer visible in contacts. To hide a user from the company's directory, go to Home > Users > Basic information. Click to disable the Display contact in company directory, and save the user. Contact Directory Scope: Define whether the user can view contacts and other users in the same PBX, site, or the entire company. A company can have multiple phone systems, multiple sites, and many users. For example, AcmeJets company has two phone systems and three sites. You can choose the user to be visible at the PBX level or at the site level. Personal contact number: Enter the user's personal contact number such as home or mobile number. The personal contact number appears on the user's Virtual Office desktop app and Virtual Office mobile app. If you enable Display contact in company directory in the user profile, the user's personal contact number will also appear in the company directory. For details, see our FAQ content on how to add a mobile number. Select an appropriate license type for VCC users. The license type assigned to a user determines the scope of available phone features such as basic calling to advance contact center capabilities. For Virtual Contact Center Editions users: From the drop-down menu, select VCC Agent option to assign VCC agent privileges. Note: The VCC Agent service is shown in the drop-down only if you have available licenses in the pool. See Licenses for more information. For Expert Connect services which allows your VCC agent to collaborate with experts in the team via 8x8 Unified Communication applications such as Virtual Office desktop app or Virtual Office mobile app, you must add an appropriate Virtual Office Editions service bundle from the drop-down menu. See how to set up Virtual Office Users. Note: Currently X6 or X7 or X8 service bundles support VCC services. For Expert Connect capabilities, you must select X7 or X8. Enter an Extension Number. Every user with the VCC Agent service must be assigned a VCC extension number. VCC extension number is a virtual number used to route calls and other interactions to the agent. You can enter a valid extension number or let the system suggest one. The length of extension number is determined by the dial plan set up in your phone system. Agents with an extension number can handle calls and other interactions routed via channels and queues. Additionally, they can place calls or receive calls from other users in the contact directory. Note: If you are an X Series customer, then the extension number settings are available under the Virtual Contact Center Agent Settings section. Click to disable the Display VCC contact in company directory to hide Virtual Contact Center user's presence in the contact directory. This option is enabled by default. A VO-VCC user with both Virtual Office and Virtual Contact Center licenses appears twice in the contact directory: once with Virtual Office extension and once with Virtual Contact Center extension. You can show both Virtual Office and Virtual Contact Center extension numbers, just one, or no extension numbers for the VO-VCC user in company contact directory. You can add agents in Configuration Manager with dedicated extensions and define them to serve multimedia channels (voice, chat, email). When you assign VCC Agent services to a user in Configuration Manager, every agent must get an extension number. For agents requiring a locked-down SIP phone, you must assign a dedicated extension. 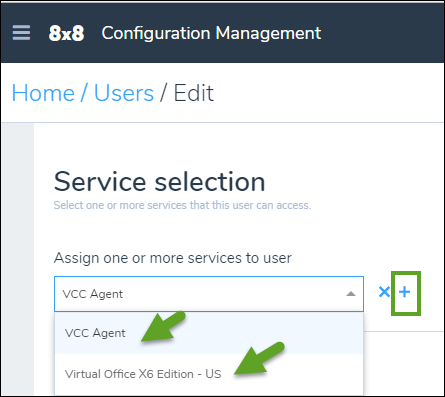 Select VCC Agent or an X series VCC service bundle, and enter an Extension Number. For a VCC agent service, a VCC extension number is mandatory. It is the private routing to the agent. Enable VCC Dedicated Extension. VCC dedicated extension is used for agents who require a locked-down SIP phone. If your agent requires a locked-down SIP phone to handle Virtual Contact Center calls, then they must be dedicated to handling only the contact center calls, and you must assign them a dedicated extension. Agents with a dedicated extension are assigned with an 8x8 supported SIP phone which can handle only those calls routed via Virtual Contact Center voice channels. With a dedicated extension, the extension and Direct-in-Dial (DID) numbers are permanently redirected to Virtual Contact Center agent channels. Select a Phone Number. Any claimed or ported phone number in Configuration Manager can be used as a voice channel in Virtual Contact Center. Assign these numbers to agents to convert these into VCC direct agent routing channels. When you log into Virtual Contact Center Configuration Manager, these assigned phone numbers show up as phone channels. See how to claim or port numbers. Note: For provisioning the public facing phone channels for Virtual Contact Center, work with your 8x8 representative. Important: You must activate your device to save the user settings with a dedicated extension. Save your settings. A confirmation message indicates if the user is created successfully. To create a user with unified communications, refer to the Virtual Office Configuration Manager help topic on Add users. 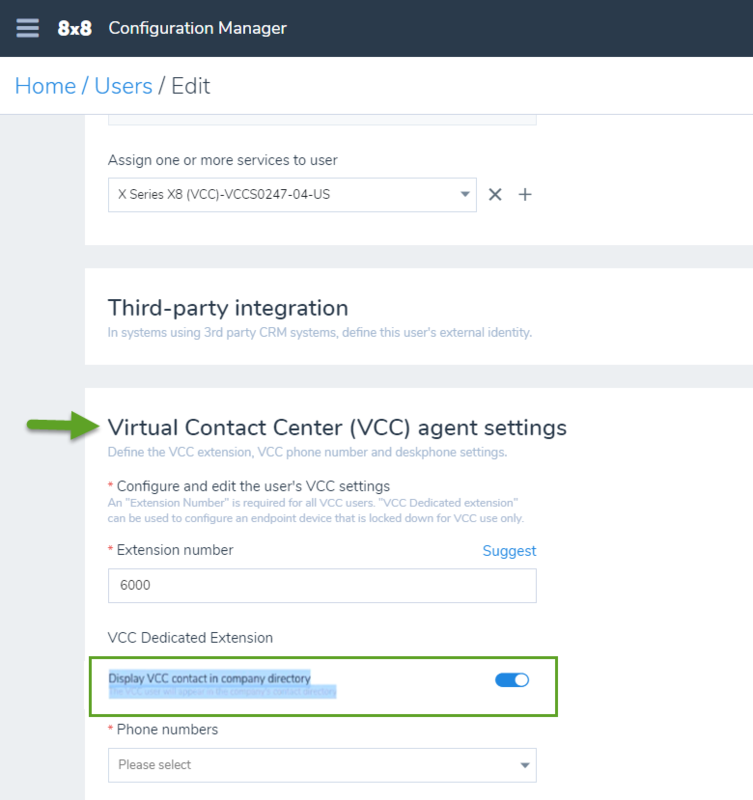 After assigning a user with VCC agent service, you need to configure agents to queues, define agent specific properties in the Virtual Contact Center Configuration Manager. You must log into Virtual Contact Center Configuration Manager application to complete these tasks. Agents created in Configuration Manager show up in the Users tab in Virtual Contact Center Configuration Manager. The users are by default assigned to an agent group called ungroup. In the Virtual Contact Center Configuration Manager, you can create a new agent group to suit your business needs and assign the users. Every Virtual Contact Center has one primary administrator with privileges in all categories. This administrator's access can be edited or revoked by another administrator. You can grant administrator privileges to any existing user by adding the user to the administrator's group. You do not need to assign this user with the Virtual Contact Center Agent service. From the main menu in Configuration Manager, go to Home > Company > Admins. Search for a user and add the desired user as an administrator, and click Save. Note: These administrators have privileges to configure both Virtual Office and Virtual Contact Center features. To define granular role-based administration within Virtual Contact Center, go to Virtual Contact Center Configuration Manager and define new roles with custom privileges within the tool. These privileges are only applicable to configuration functionality within the Virtual Contact Center Configuration Manager. For details on role-based administration, See Virtual Contact Center Roles and Administrators.